Judith, who married former NSWPF Retired member John KING, after the death of her first husband ( Bernard MORTON ) will be buried at the grave of Bernard. 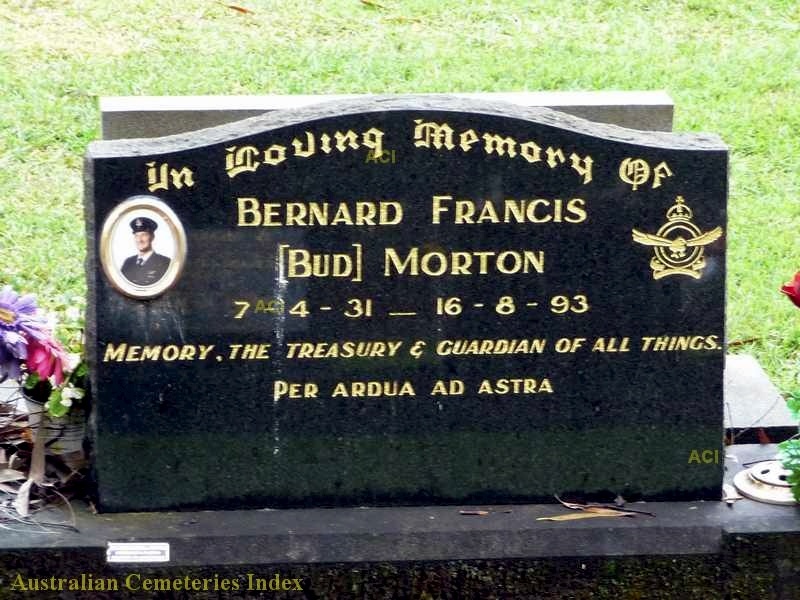 Bernard Francis ‘Bud’ MORTON ( late RAAF – Warrant Officer / Flying Officer / Squadron Leader – 025983 ) – the first husband to Judith, was born 7 April 1931 and died on Monday 16 August 1993, aged 62. Bud is buried at Point Clare Cemetery: Lawn 7, Row 39, Plot 19. Further research shows that Bernard was murdered, by sawn-off shotgun, at the The Grange Hotel, Wyoming, where he worked part time in the bottle shop. SYDNEY: The shooting death of an elderly bottle shop attendant on the NSW central coast on Monday has baffled and shocked police, who describe the shooting as “callous and senseless”. The detective in charge of the investigation. Sergeant Pat O’Brien, said yesterday police did not know why 62-year-old Bernard Francis Morton, of Wyoming, was shot. They believed the gunman’s main motive was robbery. Mr Morton was shot once in his chest with a sawn-off shotgun at The Grange Hotel in Wyoming, where he worked part-time, about 5 pm. He died soon after, despite desperate attempts by ambulance officers to revive him.